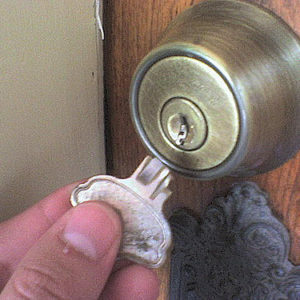 After a long day at work, there is nothing more stressful than coming home and trying to unlock the front door – only to have the key break in the lock. It is important to follow a few simple steps in order to make sure that this problem can be dealt with efficiently with a minimum amount of fuss. Action Lock has years of experience dealing with lockouts like this. Read our helpful guide about how to deal with being locked out after snapping a key in the lock. Some people can panic when their key snaps in the lock, and they might be tempted to force the door with a shoulder barge or a kick. However, this should be avoided because the door might suffer some irreversible damage which could be expensive to fix. Panicking won’t help the situation and could make any young children distressed if they see their mum or dad getting flustered. Take some deep breaths and remain as calm as possible so that the problem can be dealt with properly. After resisting the urge to force the door, get on the phone to Action Lock and call a locksmith to deal with the problem. If the person locked out doesn’t have their mobile phone on them, they should go to a neighbour’s house and use their phone instead. If the front door becomes inaccessible, unlock the back door if there is a key available. However, don’t be tempted to force the back door to gain access if it is locked and there is no key handy. This could lead to damage which may require expensive repairs. Some people bury spare backdoor keys in the garden or leave them under potted plants. People should look for the spare key if this is the method that they use. Whilst waiting for help to arrive, it is a good idea to go and wait inside a neighbour’s house, especially if the weather has taken a turn for the worse or young children are with the homeowner. Standing outside in the pouring rain or having to calm down agitated children won’t be much fun, so it will be a welcome relief to be able to sit inside a neighbour’s house with a drink and something to eat. Keep an eye out for the locksmith to be able to meet them when they arrive. Make sure to keep any phones fully charged and switched on so that the locksmith can call if they need help with directions or if they need to announce when they have arrived. Once they have arrived, the problem will be fixed in next to no time at all. Reading this on a smartphone whilst locked out of the house? Call Action Lock now!